Grant Taylan is an adventurer-paleontologist also known as ‘The Dinosaur Detective”, a polite term for what he really does, which is track down the more dangerous criminals in the Dinosaurs Fossil Black Market and bring them to justice, sometimes the hard way. 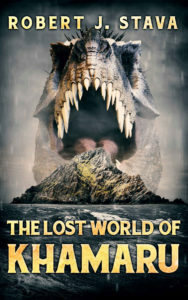 But his latest case is about to land him in the strangest situation of a lifetime: a vacation island in the South China Sea known as “The Lost World of Kharamu”. Developed by the Chinese bio-tech corporation MuTron International, they’ve taken Michael Crichton’s Jurassic Park concept in a very different direction: the ultimate immersive role-playing experience tailored to only the wealthiest clients. On the resorts first major beta run, Taylan finds himself fighting dinosaurs, Russians, Vietnamese commandos and his ex-girlfriend in the ultimate vacation gone-wrong, where only the strongest, quickest – and the luckiest – will survive. Available from Amazon.com starting June 23 – order now!